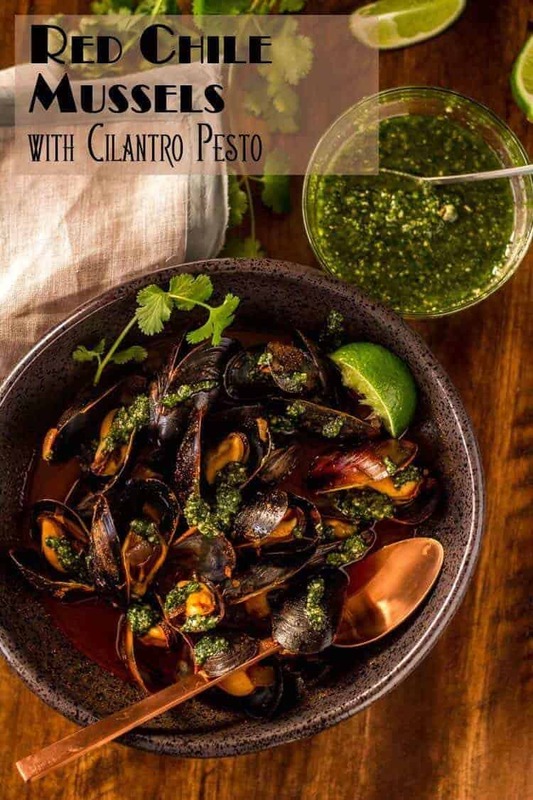 A little kick from New Mexico red chile powder sets my Red Chile Mussels with Cilantro Pesto apart from all the rest… finished with a vibrant cilantro pesto, they’re sure to be a new favorite for bivalve lovers! A polarizing ingredient? I believe so. Bivalves are a class of mollusks that include mussels, clams, oysters, and scallops. They have an exterior protective covering that is a two part hinged shell (hence the class bivalve) with a soft invertebrate body. That soft body is delicious IMHO but they don’t look all that pretty. Perhaps beauty is in the “eye of the beholder?” I get really excited about cooking and eating each and every bivalve. Bivalves are nutritional powerhouses loaded with protein, minerals, and healthy fats. They’re great for the health of oceans too, as they’re filter feeders, and help keep the water cleaner. It is important to know the source of your mussels (clams, oysters, scallops). Farmed mussels need to be “sustainably” farmed in clean water. Even native, local mussels can contain biotoxins. Once upon a time, the rule of thumb was to only consume mussels, oysters, and clams during the months that contain the letter “R,” to avoid the toxin found in red tide. However, red tide levels are very closely monitored now, and commercially available mussels from a reputable source should be fine. Know your sources! So, back to my question… Do you love them, hate them, or are you ambivalent? My typical recipe for mussels is some rendition of Spanish Mussels with Chorizo and Saffron Broth. We love them prepared that way! Recently, however, I received a text from my son-in-love Devin that they were in Las Cruces, NM. at a favorite brewpub – Bosque Brewing Company – doing a happy dance over a bowl of red chile mussels with cilantro pesto. It was his suggestion that I come up with my own version for the blog. I did. And they’re really delicious! Of course the foundation of the broth is New Mexico ground red chile powder. There really is no substitute. However, I have personally used this brand, and it is available online from Amazon. 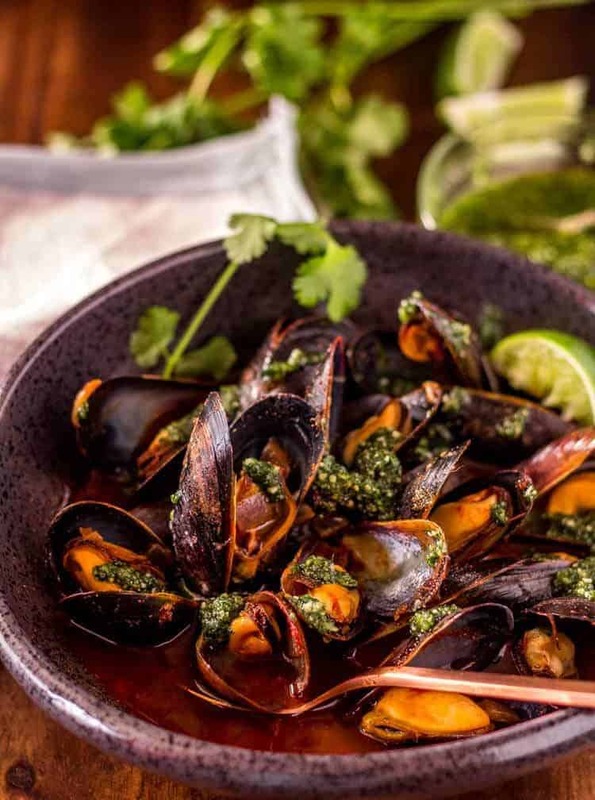 The elegant finishing touch to this simple red chile mussels dish is the cilantro pesto. It adds a bit of bright, herbal flavor, and the color is pretty. I always say we eat with our eyes too. 😉 If you love mussels, you’ve got to give this recipe a try! 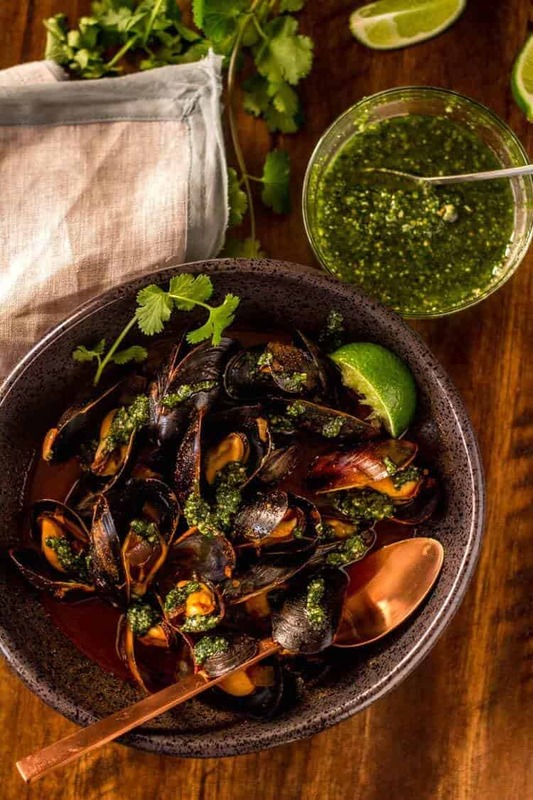 A little kick from New Mexico red chile powder sets my Red Chile Mussels with Cilantro Pesto apart from all the rest... finished with a vibrant cilantro pesto, they're sure to be a new favorite for bivalve lovers! Add cilantro, pepitas, and garlic to the bowl of a food processor. Pulse until finely minced. Slowly pour in the olive oil with the machine running until you reach the desired consistency. Add the parmesan and pulse briefly to combine. Set aside. To a dutch oven or deep saucepan with a lid, add the olive oil, chopped onion, and garlic over medium-high heat. Cook until the onion softens and is nearly transparent. Do not brown. Add the cumin and Mexican oregano. Cook an additional 1-2 minutes until fragrant. Stir the red chile into the stock (break up any lumps), and add to the pan. Cover and simmer until ready to add the mussels, but at least 5 minutes. Add the prepared mussels, and replace the lid. Simmer 5 minutes until the mussels are open. Ladle the liquid over the mussels, and cover until ready to serve. 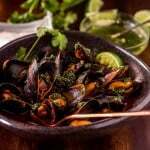 To Serve: Ladle the mussels and their broth into bowls, and spoon the cilantro pesto over top. Enjoy! If you need a tutorial on cleaning mussels see How to Prepare Fresh Mussels Like a Boss. Macronutrients (approximation from MyFitnessPal.com): 411 calories; 47 g protein; carbohydrates 19 g; fat 16 g.
Thank you!!! Bobby has been wanting to cook up some mussels and was asking me for some ideas. This is perfect. We'd love this! They look fabulous! We do share our love of all things chile ;-) I'm glad you appreciate the recipe, and I do hope you give it a try... Thanks for stopping by MJ! These are fantastic! The mussels stand up really well to the two sauces. A saison would be a good beer pairing. I agree! Saison would be an excellent choice!